Paw injuries occur rather frequently and can cause limping in dogs. 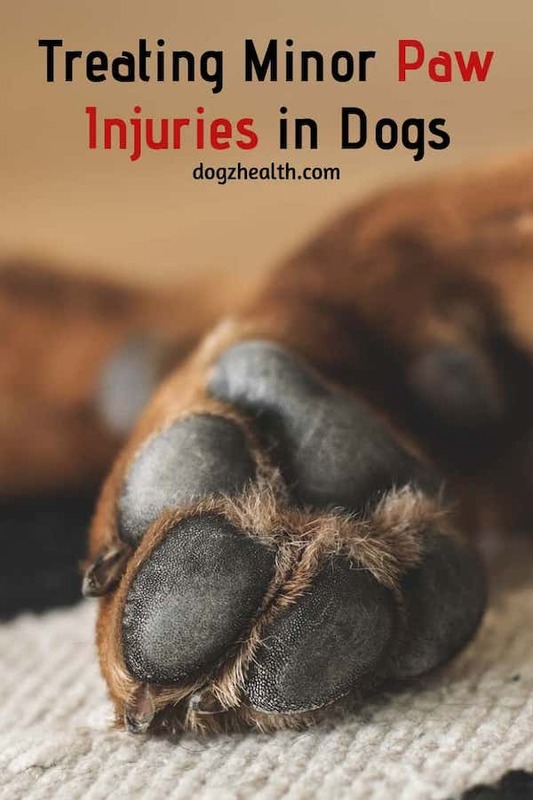 This page looks at some possible causes of dog paw injuries and how to use simple remedies to treat paw injuries and for general dog paw care. 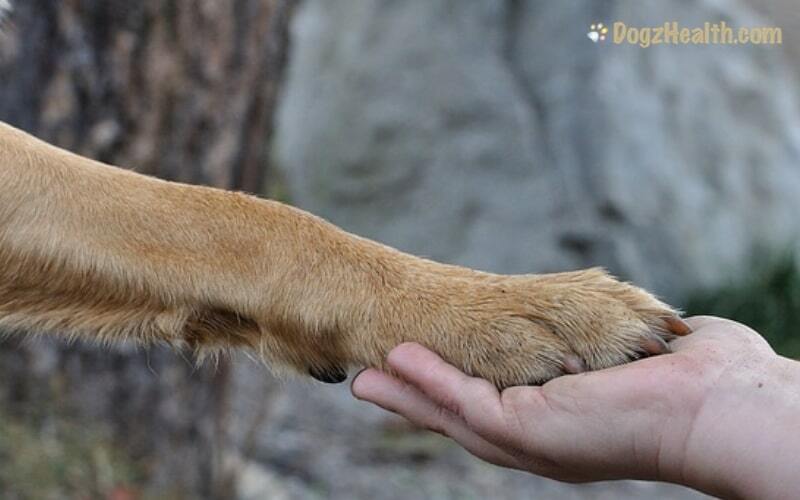 Since dogs are always running and walking bare-foot, it is extremely easy for them to sustain paw injuries. As dog parents, it is important for us to learn about common causes of paw injuries, first-aid treatment, and how to give good dog paw care to our dogs. If the dog paw injury is the result of a cut on the footpad, there will be bleeding, sometimes profuse. If there is a foreign object lodged between the toes, you may be able to see the object if you look carefully. You may see signs of irritation. If there is an infection, you will see redness and swelling. Your dog may also constantly bite or lick the affected area in an attempt to get rid of the object. A broken nail is also easily visible upon inspection. Broken toenails can be extremely painful and the dog will limp and also lick the affected toe. A dislocated toe may be swollen and painful to touch. The dog will favor the affected limp and will cry out when you touch the toe. When an insect bites or stings a dog’s paw, the paw will likely to be swollen. You dog may feel pain and itchy. If it’s a bee sting, the stinger may also be visible at the site of the sting. Treatment depends on the specific type of injury sustained. Except for deep cuts, broken or dislocated toes, most dog paw injuries are fortunately rather minor and can be treated at home. If you notice that your dog seems to have an injured paw, you need to first determine the cause of the injury. If there is bleeding, look for the source of the blood and determine whether the bleeding is mild, moderate, or severe. For moderate to severe bleeding, always go to the vet for treatment. For mild bleeding caused by a cut, look carefully at the wound and try to determine the full extent of the slice. Clean the entire area with 50/50 water and hydrogen peroxide (3% Food Grade) mixture. It may be easier to dip the whole paw into a bowl of the hydrogen peroxide mixture to thoroughly disinfect the wound. Once the cleaning is finished, apply a non-adherent dressing and bandage to the paw (do not wrap too tightly). Leave the toes exposed to check for signs of swelling. If the cut is caused by an object which is still stuck in your dog’s paw, remove the object only if it is not stuck deep into the footpad, and if it will not cause more bleeding when being removed. 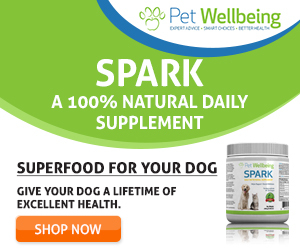 It is best to take your dog to the vet for treatment if you are not confident. If you do decide to remove the object, be careful not to hurt yourself – the object that is stuck in your dog’s paw could be sharp enough to cut your skin. If the crack is superficial and there is no bleeding, chances are it is caused by dryness or some form of injury. Clean the paw and apply a soothing lotion or ointment to the pad, such as this one: Organic Nose and Paw Pad Healing Balm for Dry Chapped Cracked Skin with Hemp Oil and Shea Butter . On the other hand, if the crack extends below the superficial layers of the pad and is bleeding steadily, then most likely it needs stitches. Try to clean the wound with a 50/50 mixture of hydrogen peroxide and water and a clean towel. Then apply a non-adherent dressing and bandage to the paw, and take your dog to the vet. A dog with a broken toenail can be in great pain, so handle the dog carefully as he may act aggressively due to the pain. Only pull the damaged nail off if you are certain the attachment is only nail and does not involve any blood vessels or the “quick”. After pulling off the nail, dip the entire paw in a 50/50 mixture of hydrogen peroxide and water to disinfect the paw. Dry the paw and place a light bandage on the cracked nail to protect the area from bacteria, dirt and further trauma. There is profuse bleeding from the area. There is a discharge such as pus from the area. The cracked nail is dislodged from the rest of the nail, but is still attached by a substantial portion of nail and you can see that the quick is exposed. Visit our page on Bee Stings for information on treatment if your dog has been bitten or stung on the paw by an insect. Check your dog’s paws for cuts, scrapes, burrs, or other objects that may have lodged between the toes after he has been outside. Keep your dog’s nails short and trimmed and regularly check that none have grown into the pad. Protect your dog’s paws during winter by wrapping their paws in protective boots or use a natural de-icing spray, such as Safe Paw Non-Toxic Ice Melter . Do not let your dog run on a hot road or pavement to avoid burning his pads. Consider getting your dog some doggie boots for extreme weather.